Alice the Chalice – UU coloring pages and other resources for Unitarian Universalist kids! UU coloring pages and other resources for Unitarian Universalist kids! The following message for all ages was delivered at First Church in Boston, MA on January 12, 2014 during our Standing on the Side of Love “Courageous Love” service. You are welcome to use this message in your congregation. Download script here (DOC). This all started when we added a fun candle with a spider design to our home chalice. After saying grace and lighting the chalice, Peter commented how much he liked our Halloween-themed candle. Then, a flash of inspiration crossed his face. “I have an idea! What if we made a chalice out of a pumpkin?” Well, we just so happened to have the perfect small round pumpkin to try out this crazy idea. We are happy to report that it works! You, too, can have your very own Pumpkin Chalice to celebrate the harvest season or for Halloween festivities! This is a fun project for a family to do together. Remember to always use caution with knives and open flames around children. 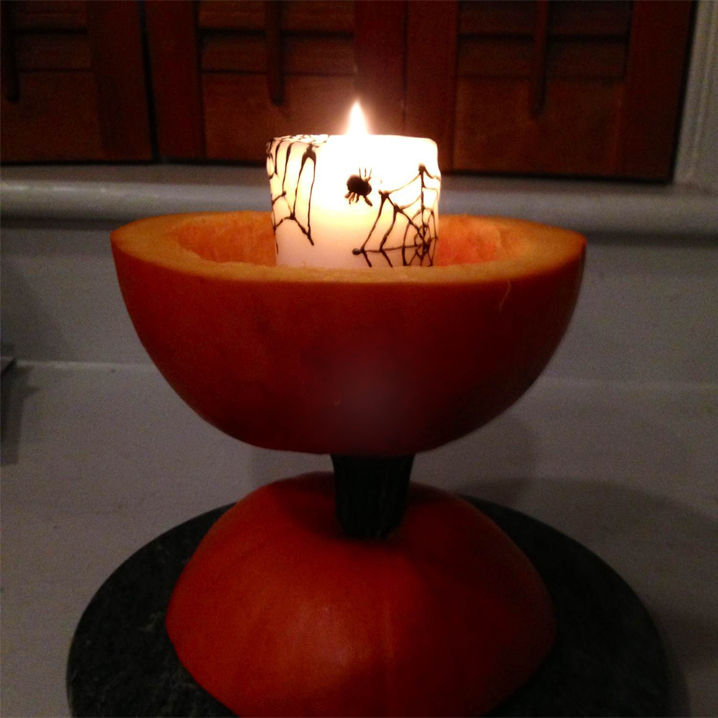 Do not leave your pumpkin chalice lit unattended. Find a small Pumpkin with a straight stem. The stem will be used to attach the top to the base. If the stem is curved, cut the end so it is as straight as possible. Note we do not recommend this project with larger pumpkins as they will not be as stable. Stretch a Rubber Band around the middle of the pumpkin. This will help you make as even and straight a cut as possible. With a sharp knife, cut the pumpkin in half on a cutting board. Here’s the fun part for little ones! Scoop out the pulp and seeds. Scrape the inside of the pumpkin so it is just a shell. If you wish, roast the seeds. Our favorite recipe is to toss seeds in melted butter and salt and roast in 300 degree oven for 30 minutes. Place the bottom half of the pumpkin upside down on the cutting board. Trace the stem so you can cut a snug hole in the bottom of the pumpkin. Fit the stem firmly into the hole to form the chalice. If chalice is not stable, make hole slightly larger so stem can be inserted further into base. Place a votive or pillar candle inside! Print Alice the Chalice project template page. Select black and white to color in yourself (or photocopy) or use a pre-colored template. Print black and white or color template. Color the Alice the Chalice template pieces – body, face, base and flame. Glue the rectangular body piece around the tube to cover it. Glue the face piece onto the top of the tube. Glue the base piece at the bottom of the tube. 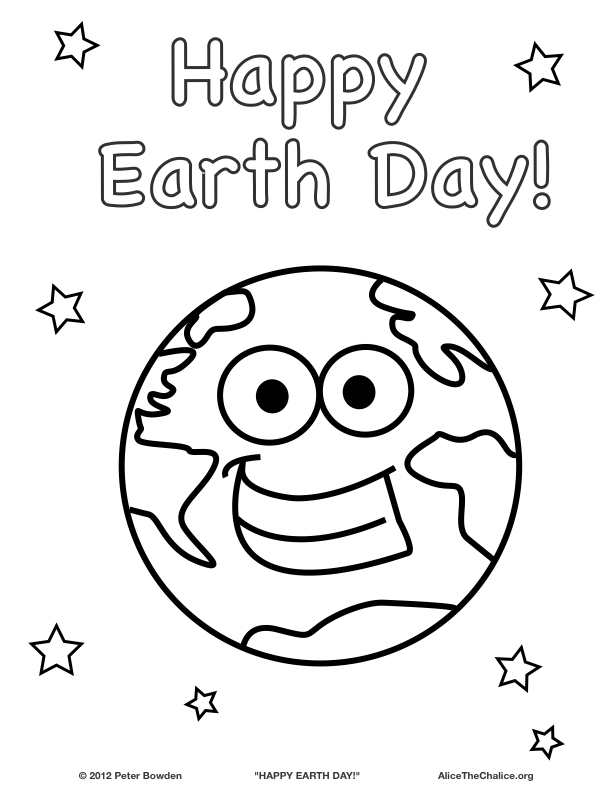 Here is a “Happy Earth Day” coloring page. Available in JPG and PDF. Permission granted to copy for use at home and in local Unitarian Universalist congregations. Contact us for other use. Color in Alice the Chalice and draw her flame with this coloring page!